Studies show that most Americans are morally conservative. It is commonly known that Oreos are the most delicious mass-produced cookie. Experience shows that watching television has no effect on health. The use of weasel words is not always intentional, nor is it necessarily meant to deceive or manipulate the reader. It’s possible that studies actually do show some fact indicated by an essay writer. But in order for a claim to be taken seriously, the writer should indicate, perhaps in a footnote, exactly what studies he or she is referring to. It is best to avoid weasel words entirely, although it is possible to use them in a non-weasely way. They are usually unconvincing, especially to experienced, discriminating readers. The list below gives some examples of words often used in a weaselly manner. 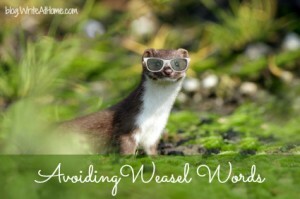 Have you resorted to weasel words in your writing? It’s common, but not by any means limited to student writing. Now that you know what they are, I bet you find them all over the place. On the other hand, I find that “Some argue…” and “Popular wisdom has it…” are usually used to introduce a challenge to or debunking of the point that popular wisdom or the some who argue hold as valid. That’s true. It’s possible to use “weasel words” without being weaselly. Appeals to reason, commonsense, and popular opinion can be legitimate. It’s just wise to be careful.